When we reflect on the most significant leaps in the world of Armoured Fighting Vehicles since the Second World, such as the development of the Infantry Fighting Vehicle by Russia, the first true Main Battle Tank by the UK, there is one development that has led to the life saving MRAP program that has not received its due recognition and that is the South African developed Mine Resistant Vehicle. The concept was simple. When an anti-tank mine detonates, it releases an explosive energy and a flat belly of a vehicle acts as a sail, catching the energy and thus destroying or incapacitating it. South Africa did away with a flat belly and used a V-Shape, as well as increasing the ground clearance so that the energy would escape and dissipate. The sloped angle also increased the thickness of the V-Shapes armour. Most land mines would also serve as to incapacitate a vehicle by blowing its tracks or wheels off, which is known as a mobility kill. The wheels are attached to other parts of the vehicle such as the power train, axles and suspensions. All these parts can be heavily damaged as the wheels are blown off as they are located within the vehicle. So South Africa changed the layout so that these parts were on the outside of the vehicle. This meant they were blown off cleanly and accessible when needing to be replaced in the field with spares carried on board by the crew. 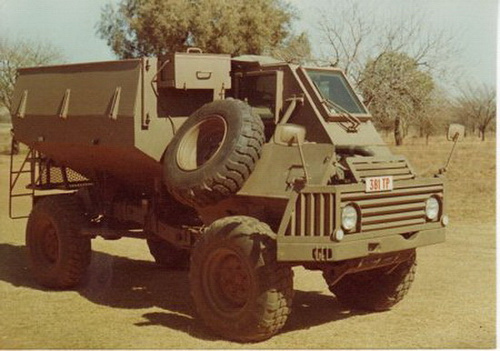 The Buffel entered service with the South African Army in 1978. 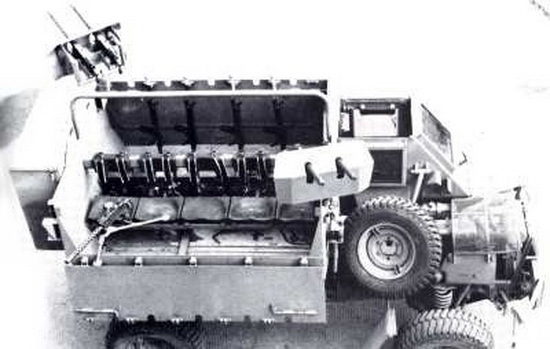 1400 were built using a German UNIMOG chassis. The Mercedes engine located at the front of the vehicle. The driver had a raised armoured compartment, which sat partly across the engine at the front on the left side. Behind him was the troop compartment, which could accommodate 10 troops. It had a high ground clearance and V-Shaped bottom. The troops sat back to back on benches (x5 per bench) and could lower the sides to climb out. A MG could be mounted at the front on a pintle. The Army used it in several conflicts with its neighbours such as the South African Bush War. It was exported to Sri-lanker in 1985, who also used it in their own Civil War and it still remains in service. It has been replaced by more modern vehicles in South Africa such as the indigenous Mamba series.